The Cleveland Cavaliers recently wrapped up the most successful season in franchise history. The off-season signing of game-changing players and critical mid-season trades paid off, culminating with the team’s exciting NBA Eastern Conference Championship and NBA Finals run. It was a storybook year for the Cavs, filled with on-the-court success and enthusiasm. However, some of these outcomes lie in the organization’s off-the-court moves and dedication to driving long-term fan loyalty. The team’s all-star lineup certainly boosted its 45 percent revenue increase and sell-out season, with an average of 20,562 fans per game. However, data wins the crown as the ultimate driver of the organization’s sales campaigns. In fact, the Cavs have been committed to capturing and analyzing fan data for quite some time. 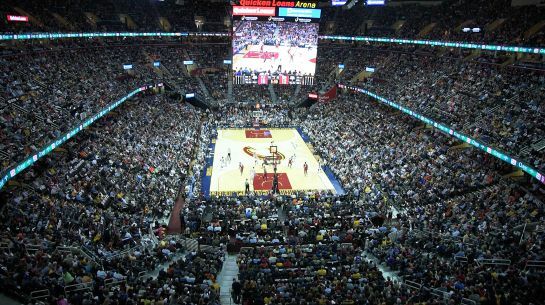 The Cavs utilize the Veritix platform and its ID-based digital ticketing technology, Flash Seats®. Since 2006, the Cavs have patiently rolled out Flash Seats to season ticket holders and the general public. Today, the Cavs are at 98 percent digital ticket adoption and will be at 100 percent next year, providing them with valuable, identity-based data about everyone attending a game at Quicken Loans Arena. “With digital ticketing, we’ve been able to understand the full life-cycle of a single ticket, including the identity of every person who has touched it along the pathway to an event,” said Kevin O’Toole, Senior Director of Business Intelligence for the Cavs. In addition to gaining identity-based data about the fans that make up the Cavs’ primary market, the organization collects information on the fans that receive ticket transfers and those who place bids for tickets on the team’s secondary marketplace, tripling their sales funnel to more than 60,000 fans per game. The Cavs’ ability to capture unique identity-based information about fans is further amplified by the Veritix platform’s open API layer. The functionality allows the Cavs to map ticketing data to other enterprise applications, including its CRM, point-of-sale, marketing automation and mobile app systems, for cross-channel segmentation and analysis. “Through the interconnectivity of our systems, we can pull a variety of relevant data points and connect them together to gather a 360 degree understanding of our fans,” said O’Toole. At any moment in time, the Cavs can analyze a fan’s demographic information, ticket purchase history, food, beverage and merchandise preferences, and more. With years of insights and a clear understanding of fans, the Cavs were ready to execute various initiatives to capitalize on the team’s success and drive loyalty. The increased loyalty has resulted in the Cavs’ ability to go “all in” on increasing Wine & Gold Club memberships, the team’s official club for season ticket holders. So what’s the next milestone for the Cavs? While it will be tough to beat this year’s record revenue, a reinvigorated player roster and fan excitement, the organization isn’t taking its foot off of the pedal anytime soon.